Today I’d like to introduce you to a new cigar accessory that I found recently, which has really revolutionized my smoking experience. I was in the lounge the other day when our local Pinar del Rio representative made an unexpected stop-in. As an employee of the store (and since I’m known there for writing reviews) I was invited to sit in on the chat with our rep, and try some of the PDRs he was handing out. Side note: Those sticks were all winners, and I’ll be posting some info about them in the near future. After we had smoked a few cigars, the rep let slip that he manufactures his own cigar accessories on the side. Of course, the owner and I were interested in trying them out, and a few minutes later I was using Joseph Gangemi’s The Cigar Clip, the tool that will be the focus of this article. It’s a really simple-looking accessory, but when I used it, it kind of blew my mind. The clip is rounded at the end, with a coating so it does not slip in your fingers, and then the ends create a pincer, almost like pliers or salad tongs. 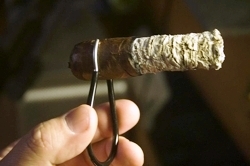 The idea is this: Instead of using a nubbing tool that stabs into your cigar, this one wraps around it. That has a few benefits. First, you do not need to actually puncture the cigar and risk breaking it. Secondly, the clip fits around two fingers really comfortably, so you can hold it just like you would any other cigar you’re smoking. I found this really great for driving, as I can have both hands on the wheel, except for when I’m actually taking a puff. The clip adjusts for down to a 37 ring gauge, and up to a 60 easily, but it should be able to hold just about any cigar on the market. I was also worried that the cigar might slip out, but this was not a problem on any of the three that I’ve used this on. Let’s talk about a few flaws really quickly. Since the prongs on the end of the Cigar Clip are metal, they can get a little hot when the cigar is really close down to the end, and if your lips touch them, you’ll notice. Now, they aren’t going to burn you, but it’s not exactly comfortable when this happens. Also, when I first received mine I needed to spend about three minutes working the metal. What I mean by this is making the adjustable portion less rigid, so that it can go down to the 37 and up to the 60. Those are really my only complaints, and for the price (just $10), I can’t be too unhappy. I believe we’re going to start carrying this is in the store, and I think it’d be a fantastic gift to give any cigar smoker. I can tell you that I’ve already considered purchasing a few this Christmas to throw in the gifts I give to the cigar smokers I know. While nubbing is a nice feature of this accessory, and the main one, there are a few other uses Joe pointed out to me that I figured I’d throw in here. The driving one is a big plus for me, and the other feature is that if you’re doing an activity that might cause your hands to be dirty, you can use this to not have to touch the cigar (the example he gave was using this while fishing so that you can touch your bait and fish without having to worry about touching the smoke). Overall, I was really impressed with Joe’s clip, and I’d recommend you all try to find one in a store near you to add to your accessory collection. If you can’t find a store, they can be ordered off of The Cigar Clip website. If you guys have any cigar tools you regularly use, or if you’ve used this one before, let me know in the comments. Full disclosure: This accessory was given to me for free by the creator of The Cigar Clip as a sample. In no way does this affect my review, and I want you all to know I was completely honest in my opinion here.